Enhance tool present in Photos app usually makes images appealing. See this article, if Photos app enhance not working in Windows 10. Most of the photo editor software available to us have enhance tool. This enhance feature will brighten up the photo and make it more appealing. Windows 10‘s built-in Photos app also have this enhance feature present. 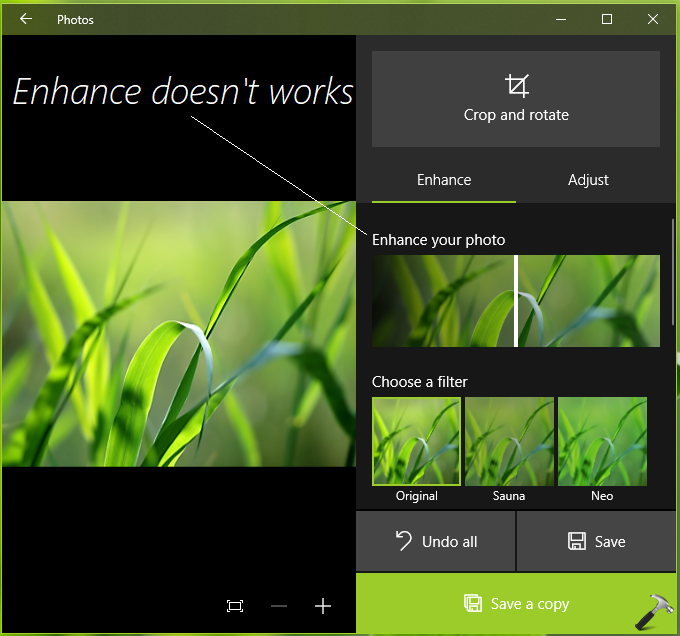 But recently, some of the users have reported that this enhance tool no longer works on their Photos app. And the filters present with enhance now makes the images awful, rather than making it appealing. This is widely reported issue nowadays on Microsoft‘s user forums. We hope Microsoft is aware of this issue and working on a fix for it. So we can expect a patch for this problem in upcoming Windows Updates. In case, if you’re facing this issue, keep an eye on latest Windows Updates, and on latest Photos app version as well. To fix this issue at the moment, you can try below mentioned workarounds and see if they helps you. First thing you can try to fix this issue is to reset the Photos app to its initials. 3. Close administrative Windows PowerShell window. Check Photos app, see if enhance tool works now as expected. You’ll find that the tool would now work fine. We’ll update this article, when Microsoft releases a patch for this issue, so stay connected!